Moscow, December 3, Interfax – Archpriest Vsevolod Chaplin, chairman of the Synodal Department for Church and Society Relations, has said that peaceful solutions should be found for conflicts in former Soviet states. Thousands of demonstrators take to the streets of Kiev after Ukraine’s opposition failed Tuesday to force out the government with a no-confidence vote in parliament, leaving the country’s high political tensions unresolved. “People are predetermined to live side-by-side in peace. Enmity, wars and total conflicts, whether they be controllable or uncontrollable, are always bad. We can see this in many events that took place or are occurring today on former Soviet soil. 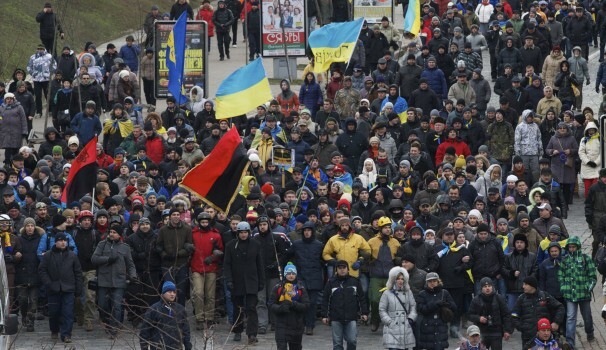 Just look at what is happening in Kiev today! Sensible people should seek to resolve any differences peacefully and help each other, instead of living by the principle of total enmity,” Father Vsevolod said at a Russian Public Chamber roundtable. “Priority should be given to solving the problems that make people suffer,” he said. “The second principle is the principle of justice: any problems that cause pain, concern and people’s suffering in the economic, social, cultural spheres and international relations must be sorted out. They must not be ignored,” he added.